As of Wednesday, I can chalk up another life experience: my first MRI. One of my eyes had been a little unhappy, so my ophthalmologist ordered the MRI to help her diagnose the problem. I’d had X-rays before, so I naively thought an MRI would be similar. I even tried to bring reading material in, on the off chance that it would take more than 5 minutes or so. Boy, was I wrong. It took a full hour, and it was one of the most unpleasant experiences I’ve ever had. 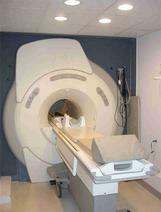 Even if you’re not familiar with MRIs, you’ve probably seen one in a hospital scene on TV or in a movie. They lay you down on a platform, immobilize your head, and slide you into the bowels of a big machine. The machine passes a series of RF waves through you, which it uses to produce detailed images of the inside of your head or body. That’s all well and good, but it wasn’t much comfort while I was actually in it. First, I had to lie perfectly still for an hour. No coughing, scratching, or twitching. They did pull me out halfway through, but just long enough to inject me with a contrast agent, then put me right back in. That wasn’t too bad, but the sound and vibration of the RF waves definitely were. It sounded like a piano tuner had gotten confused and tried to tune a klaxon horn instead, with the business end pointed right at my ears. It was loud, painful, and the vibrations were so strong, I felt like they were melting my bones. All of that was a walk in the park, though, compared to to the claustrophobia. I’m not a fan of cramped spaces, but I’d never actually gotten claustrophic before. I’d also never been in anything quite like this. The tube was barely large enough to fit me inside. I couldn’t move my head – or anything else, for that matter – so I couldn’t see outside. All I could see was the tube’s ceiling, literally inches away from my eyes. I was immediately antsy, but during the first couple scans, I clamped down on the uneasiness and took in the experience. At the beginning each of scan, the techician told me over the intercom how long it would be. They started short, first 30 seconds, then a minute and a half, then ramped up to three to six minutes. By the third scan, the enclosed space had me ready to panic. I managed to talk myself out of it, just barely, by thinking of it as a mental exercise. I challenged myself to keep control. I kept my eyes firmly closed and tried to think about other things – friends, family, weekend plans, work. The blaring of the RF waves was overwhelming, though, and I couldn’t concentrate for more than a few seconds at a time. Still, I managed to keep control through the first series of scans. I counted up each one, fiercely anticipating the 60 minute mark. When the technician pulled me out at 28 minutes, I was ecstatic, and immediately asked for advice. She looked vaguely surprised. So much for bedside manner. The break didn’t last long, anyway. She didn’t even take off the restraints. She just wiped my arm, injected me with the contrast agent, taped me up, and pushed me back in. 32 more minutes of agony. After a few more scans, I had a newfound appreciation for people who suffer from depression, anxiety, and other psychological problems. I was in a lot of physical discomfort, but that was nothing compared to the constant, overwhelming fear and panic. The urge to tear off the restraints, claw apart the walls of the tube, to just plain get out, was incredibly powerful. When they finally pulled me out, I was drained. I could barely sit up. The effort it had taken to hold myself together and keep from panicking had drained everything out of me. I didn’t care, though. I was so relieved to be out of that damn tube! To make a long story short, my eye is fine. Plus, as a bonus, I got the raw data from the MRI, which I converted into images and animations. So cool! By the way, I went to El Camino Hospital, which was great. The administrative staff there was helpful, and the paperwork and bureaucracy was minimal and painless. My, you really HAVE led a sheltered life. How did you get the images? I wanted to get mine but didn’t even think to get it. Ouch, that does sound agonizing – to be stuck in a tube for an hr w/o moving while having machinery whir loudly in your ear. Glad you survived (with some cool pics/animation) and good to hear that you’re still in tip-top shape. I’m pretty sure he just looked at them until they gave him his data. I don’t think radio waves are good for a person. The lady on the news just said medicare is cracking down on too many MRI’s physicians are giving as unecessary and uneeded with great radiation risks. (Lou Dobbs) The lady was in charge of reading the three medical reform bills for congress.